Higher gasoline prices, a rebound in auto purchases from July, and stronger sales of building materials and supplies provided a lift to headline retail sales, which posted modest gains in August. Core retail sales, net of auto, gasoline and building materials sales, did not fare as well as August levels slipped a notch over the month. Several segments remained fairly flat between July and August, such as food and beverage stores and sporting goods, hobby, book and music stores, while electronics and appliance and general merchandise stores actually posted declines. In addition, continued softness in clothing and departments stores suggests less robust back-to-school sales volume than initially thought. August retail and food sales totaled $406.7 billion, representing a 0.9 percent monthly increase over downwardly revised July sales, a gain of 3.6 percent from year-ago levels. Core retail sales, excluding autos, gasoline, and building supplies, fell by 0.01 percent, but are 3.8 percent higher on an annualized basis. AAA reports that the average retail price for a gallon of unleaded gas surged 8.8 percent to $3.83 in July, which helps explain the 5.5 percent rise in monthly gasoline station sales. Autos and building materials and supplies also posted strong monthly gains of 1.7 and 1.0 percent, and annualized gains of 12.3 and 1.4 percent, respectively. Surprisingly, non-store retailers reported sales fairly level with the prior month, but remain nearly 11 percent above 2011 figures. Department stores and electronics and appliance stores posted declining monthly revenues of -1.4 and -0.3 percent, adding to the year-over-year declines of -2.3 and -0.8 percent, respectively. The core CPI, excluding food and energy prices, trended lower over the year to average just below 2 percent, with larger increases generally confined to housing-related costs. However, the rise in energy prices, along with an anticipated jump in wholesale food prices resulting from this year’s drought conditions, will pressure consumers’ discretionary purchasing power through year end, at least until economic conditions firm and job and wage growth strengthen. 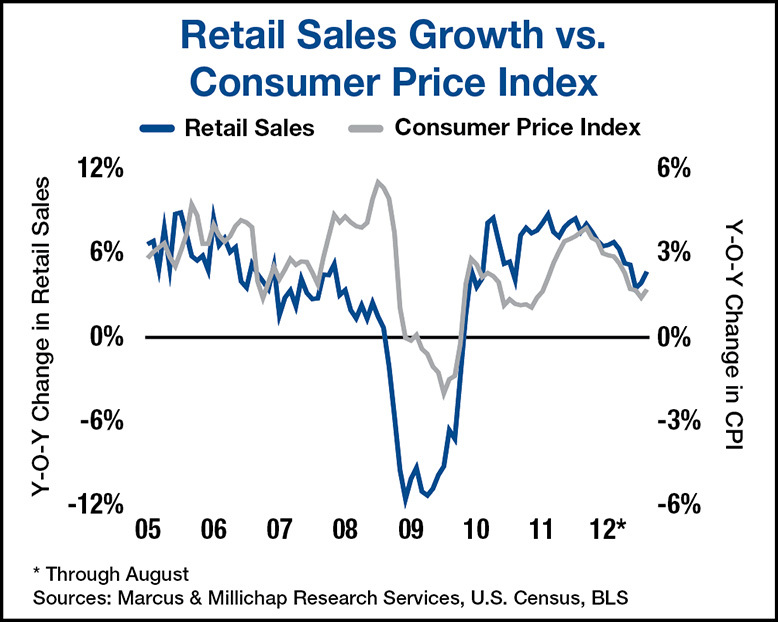 The pace of retail sales increases will likely remain moderate this year, contributing to a slower pace of overall economic growth. The renaissance in the residential sector, particularly the single-family segment, promises to bolster sales across multiple trade segments as well as demand for industrial space over the several months. Nonetheless, the recent loss of momentum in the manufacturing and trade sectors may cause a temporary slowdown in new demand for industrial space. Industrial net absorption should fall between 125 and 135 million square feet this year, nearly three times the 45 million square feet delivered. Vacancy will decline another 50 basis points to 11 percent. Tightened fundamentals should support effective rent growth of 4.5 percent nationally, and even higher for strong demand, coastal and distribution hub markets. A retail sector recovery is underway, though some retailers continue to close underperforming stores, create smaller showroom- type spaces, and downsize formats to align with urban locales and/or target demographics. What may be a brief lull in retail sales trends should not materially impact existing demand for space. Similar to supply trends, net demand for the fi rst half is on par with the same period last year. Net absorption of nearly 77 million square feet is expected to outpace completions totaling 32 million square feet in 2012, resulting in a 50-basis point vacancy decline to 9.2 percent and 1.3 percent effective rent growth. This entry was written by marcusmillichap, posted on September 21, 2012 at 6:22 pm, filed under Research and tagged Commercial Real Estate, Retail Sales. Bookmark the permalink. Follow any comments here with the RSS feed for this post. Trackbacks are closed, but you can post a comment.